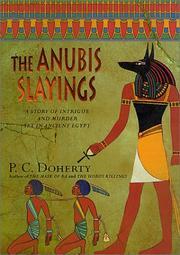 The third of prolific Doherty’s Egyptian historicals (The Horus Killings, 1999, etc.) is set in 1479 b.c., a year after the death of the Pharaoh Thutmosis has left as ruler his daughter Hatusu, who has begun her reign auspiciously by winning a great victory over the Mittani to the north. Just below her are Senenmut, her Grand Vizier and rumored lover, and Amerotke of Thebes, her Chief Judge, who plays a much more active role than his title would suggest. Besides presiding over his court, Amerotke must deal with such other matters as a major theft from the Temple of Anubis in Thebes. The sacred amethyst called the Glory of Anubis has been stolen from the Temple and its guardian Nemrath has been found stabbed to death in the still-locked chamber where the jewel was kept, even though the priest Khety and the priestess Ita, who were on guard, heard nothing amiss. Another mystifying death is that of the traveler Sinuhe. His journal and maps charting the dangers in areas imperial Egypt has an eye on have disappeared. In addition, Master locksmith Belet and his wife Seli, close friends of the dwarf Shufoy, Amerotke’s faithful servant, have disappeared as well. To complicate matters, spies are everywhere. The death and dishonor they sow will climax in the ravaging of the tomb of Thutmosis and the dire penalties that follow. Choked with bloody killings, confrontations, and betrayals, the story is gripping enough for casual visitors, but will be most appreciated by those with a special interest in the period.